You can do several things to control how things appear on a page in the Kindle Fire HD. First, you can make text larger or smaller and change the font. Second, you can choose a white, black, or sepia-toned background for a page. Finally, you can adjust the width of margins. Font Size: Tap a particular font sample to change the size. 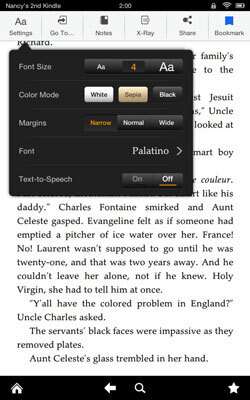 Color Mode: Tap a setting to display a different color page background. A white background will give you black text on a white page. A black background gives you white text on a black page. A sepia background gives you a pale tan background and black text which may make reading easier on your eyes, for example. Margins: Choose the margin setting you prefer. Font: Select a different font for the page. The Text-to-Speech setting in the Kindle e-reader settings allows you turn on a feature that reads text to you in English for titles that have this feature enabled. You can choose from three reading speeds, but the only voice available is a female voice. With an enabled e-book displayed, tap to display the progress bar and tools along the top, and then tap the Play button to the left of the progress bar. The audio begins. Tap the Play button again to stop the text to speech feature. You can adjust brightness manually or have Kindle Fire HD do it automatically. Go to the Home screen and swipe down from the top of the screen to reveal the Quick Settings bar, and then tap the Brightness button. If you turn Automatic Brightness on, the Kindle Fire HD will adjust brightness of the screen to compensate for ambient light conditions. If you turn Automatic Brightness off, you can press the circle on the slider and move it to the left or right to adjust brightness.